Ardwen is a Bosmer pilgrim to the Gildergreen that can be randomly encountered with her dog after The Blessings of Nature is complete, if you restored the Gildergreen with sap. She does not appear if you completed the quest by bringing a sapling back. 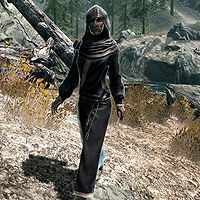 She will continue traveling from where you encounter her until she reaches Whiterun. If spoken to, she will tell you the reason for her journey, saying "We are traveling to the Shrine of Kynareth in Whiterun. I hear the Gildergreen is more beautiful than ever since it's been restored. They say that eating the fruit it bears will add years to your life." She is a respectable elemental mage, able to cast a leveled selection of spells from the Destruction, Alteration and Restoration schools. Her outfit consists of blue mage robes and a pair of boots. After completing her related quest, she will often just end up standing near the Whiterun stables 24 hours a day. She can be engaged in conversation there, but will only say "Hello", with no further dialogue available. This issue has been addressed by version 2.0.4 of the Unofficial Skyrim Patch; her random encounter quest will now terminate if she has arrived and you change locations to anywhere other than Whiterun.